The 36th edition of the Hamble Winter Series kicked off on Saturday 30 September, and included the inaugural IRC Spinlock Autumn Championship, organised by the Hamble River Sailing Club. 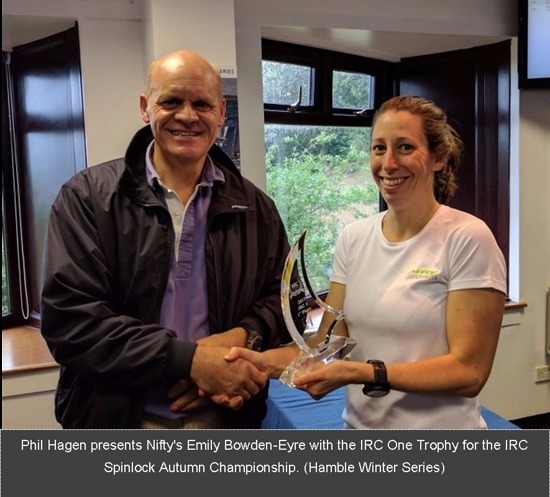 Five races were held for all classes competing in the IRC Spinlock Autumn Championship, and for those competing in the Hamble Winter Series, two races were completed on Sunday 1 October. A wide variety of yachts racing under IRC and in One Designs, enjoyed a perfect southerly wind of 15 knots on Saturday with a 16-18 knot southwesterly intensifying condition on Sunday, typifying fantastic autumnal racing. Edward Mockridge's Elan 37 Elaine was the winner in IRC Two, and was declared Overall Winner of theIRC Spinlock Autumn Championship, having won four out of five races. "It's our last event of the Season, and great to go out in a high winning overall. I Hope the championship goes from strength to strength." In the IRC Spinlock Autumn Championship, Ed Broadway's Ker 40 Hooligan VII was the winner in IRC Zero,King 40 Nifty raced by Emily Bowden-Eyre was the winner in IRC One. Rachel Hunt's Jumblesail 2 was the victor in IRC Three, and Jeffrey Dakin's Flashheart was the IRC Four Champion. Ian Smyth's team won the J/88 Class. The results from Sunday 1 October constituted the first round of the Hamble Winter Series. Rupert Wolloshin's Farr 40 Thunderbird was the winner in IRC Zero. In IRC One, King 40 Nifty just edged out J/112e Davanti Tyres, skippered by Paul & Marie-Claude Heys'. HOD 35 Malice scored two bullets to take IRC Two, and David Greenhalgh's J/97 J'ronimo finished the weekend on a high, winning the last race to win IRC Three. "Excellent courses, and just the right length!" chirped David. Mustang 30 Respect was the winner in IRC Four, but only by virtue of countback from Flashheart. Five Sigma 38s enjoyed a close battle racing in one design trim, Chris & Vanessa Choules With Alacrity won both races, Tim Levett's Machismo II was second, and Richard Kern's Light third. Oliver Love's 2 Frank was the winner in the Impala 28 Class, and in the J/88 Class Kirsty & David Apthorp's J-Dream was the victor. The Hamble River Sailing Club was a hive of activity after racing, with all competitors, friends and family welcome to enjoy a vibrant atmosphere with a licensed bar. Racing organised by the Hamble River Sailing Club continues 7-8 October, with another double helping of exciting racing in the Solent. The Hamble One Design Championship, supported by Grapefruit Graphics, and The Bugle PH, Hamble, will consist of fast thrilling sportsboats racing over two days. 30 teams have already entered, with room for more! 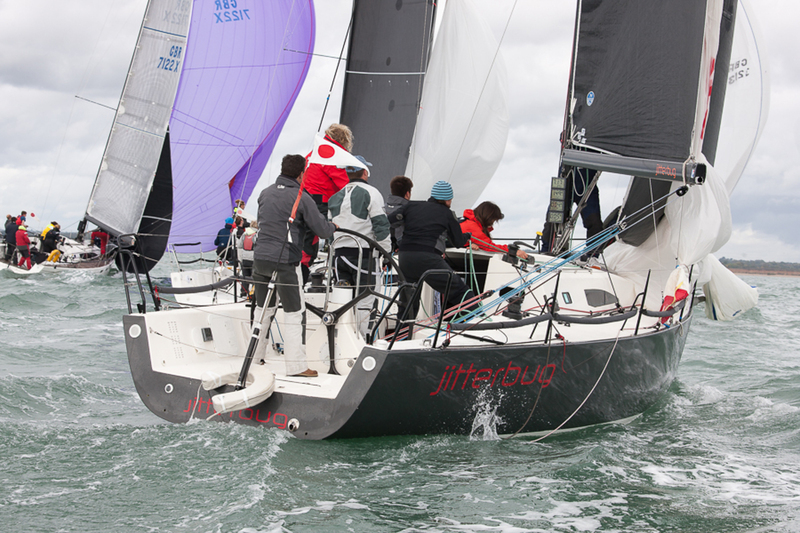 The Second round of the Hamble Winter Series will take place on Sunday 8th October.